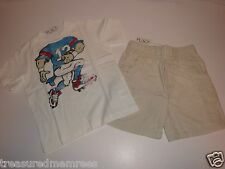 Football player graphic on tee and cargo side pockets on shorts add boyish charm. A great outfitting option, these adorable shorts and football shirt make a fun outfit that's easy to wear and looks so cute. Boys Tuffy Toddler One Piece Pyjama Train White Sz 24 Mos BNWT. Condition is New with tags. Shipped with USPS First Class Package. Air Jordan white, blue Very well made size 12 months, 24 months. Resort Getaway Baby Boy White Palm Polo Short - 100% cotton pique polo shirt has a navy embroidered palm tree at the chest, navy stripes on the polo collar and a two button placket. Color: White. 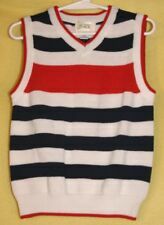 NWT Resort Getaway Baby Boy Cable Sweater Vest - 100% cotton vest has a cable knit pattern, white stripes around the V-neck collar and arm openings and ribbed trim at the hem.